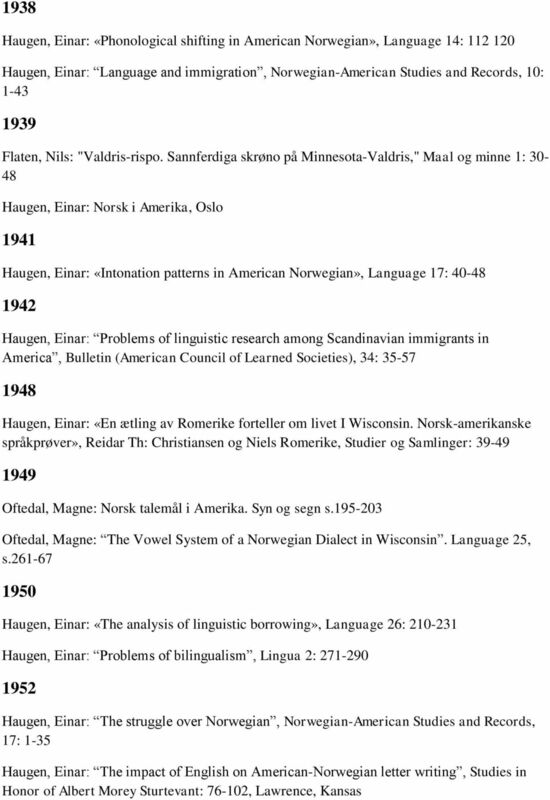 Download "Bibliography: The Norwegian Language in America (Under construction) Arnstein Hjelde"
3 1953 Haugen, Einar. 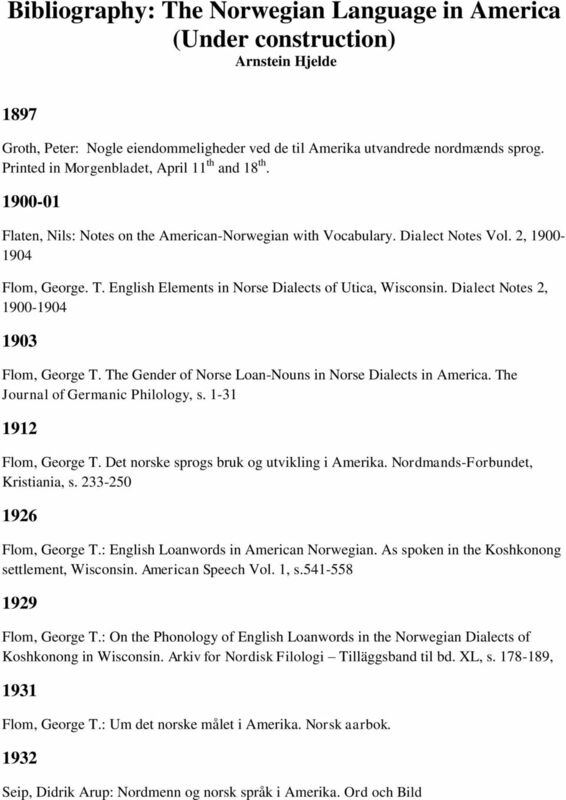 The Norwegian Language in America. Philadelphia 1954 Haugen, Einar: Some pleasures and problems of bilingual research, International Journal of American Linguistics 20: Haugen, Einar: Problems of bilingual description, Report on the Fifth Annual Round Table Meeting / Georgetown University Monograph Series on Languages and Linguistics 7: Haugen, Einar Bilingualism in the Americas. A bibliography and research guide. 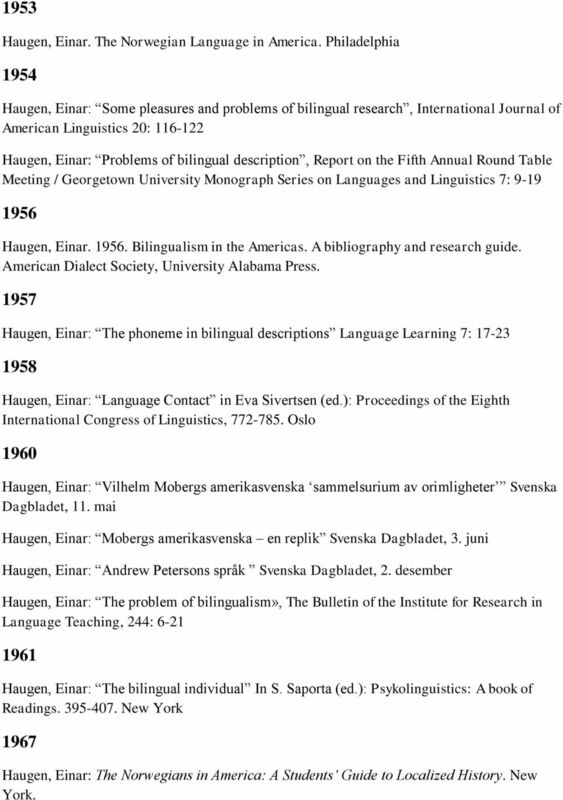 American Dialect Society, University Alabama Press Haugen, Einar: The phoneme in bilingual descriptions Language Learning 7: Haugen, Einar: Language Contact in Eva Sivertsen (ed. ): Proceedings of the Eighth International Congress of Linguistics, Oslo 1960 Haugen, Einar: Vilhelm Mobergs amerikasvenska sammelsurium av orimligheter Svenska Dagbladet, 11. mai Haugen, Einar: Mobergs amerikasvenska en replik Svenska Dagbladet, 3. juni Haugen, Einar: Andrew Petersons språk Svenska Dagbladet, 2. desember Haugen, Einar: The problem of bilingualism», The Bulletin of the Institute for Research in Language Teaching, 244: Haugen, Einar: The bilingual individual In S. Saporta (ed. 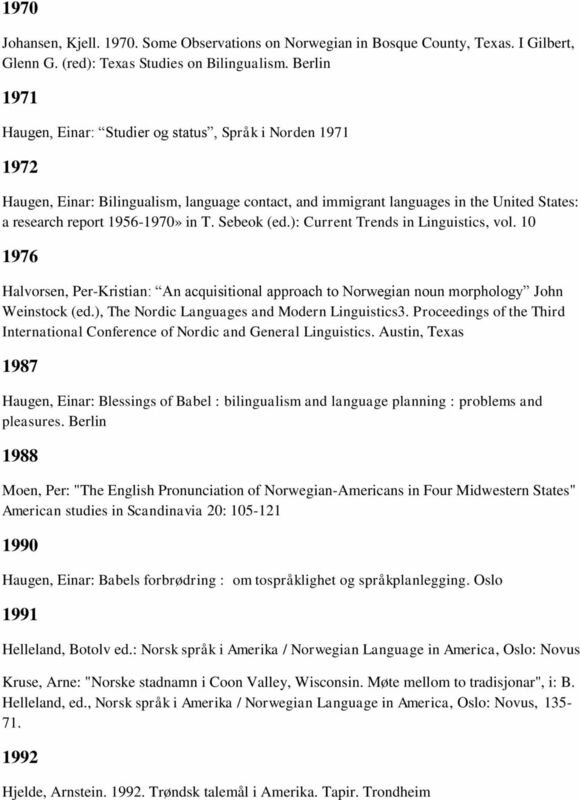 ): Psykolinguistics: A book of Readings New York 1967 Haugen, Einar: The Norwegians in America: A Students Guide to Localized History. New York. Alle dager kl. 9-15.00 på rom z612. NORWEGIAN and Recorded Program 1999 Simon & Schuster, Inc. Reading Booklet 1999 Simon & Schuster, Inc. Pimsleur is an imprint of Simon & Schuster Audio, a division of Simon & Schuster, Inc. Mfg. in USA. Kost-nytte innen sikkerhet: Hva er prisen, hva er verdien, og hvordan prioritere blant tiltak? Frykt, flukt, men ingen fremtid; erfaringer og utfordringer i arbeidet for mennesker uten lovlig opphold. Pensum Bachelorstudium i Retaildesign Westerdals Oslo School of Arts, Communication and Technology 1. studieår 1. semester Emne: Fellesfag 1. Delemne: Innføring i teori og metoder Gripsrud, Jostein. 2011. ##8,PEDOLOGIJA,J:EN,J:NORVEŠKI Meddelelser fra #PPNORSK INSTITUTT FOR SKOGFORSKNING Reports of the Norwegian Forest Research Institute 38.16 #NNThe micromorphology of some Norwegian forest soils #A!G. Kopier av innspilte lydbånd finnes også i fms 770 (tidligere avlevering). Her finnes også register over disse båndene, se eske 61. Hvilken rolle spiller inputfrekvens i tilegnelse av ordstilling i underordnede setninger hos norske barn? Oftedal, E. and Foss, L. "Dynamics of Legitimacy Building" Paper submitted to Entrepreneurship Theory and Practice, December 2012. Dialektendringsprosessar 2008 2014 Formidling Masteroppgåver: Bøe, Per Sigmund Sævik. 2013. Språkendringer sør på Jæren. En sosiolingvistisk studie i virkelig tid fra Ogna. Doublet, Maria-Rosa Raphaëla.